Calvin was baptized today. 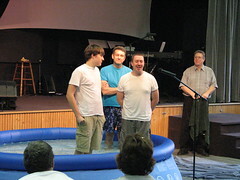 It was special to have 'John the Snell Baptist' baptize Calvin, as he has now baptized all three of our sons. John's spiritual impact on our family has been immense. We appreciate him so much. I'm not sure what Calvin's namesake would say about this afternoon's ritual, as he reportedly condoned the persecution of the anabaptists of his day. Bjorn and Jenny made a quick trip down from Canada to witness the event. Wedding planning is in full swing, and Esther and I needed to cough up an invitation list for them. In another month, it will be graduation day!